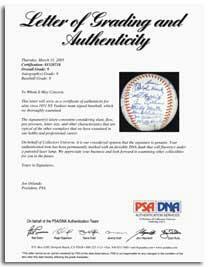 A PSA Letter of Authenticity accompanies certified multi-signed objects. Professional Sports Authenticator (PSA), the world's largest autograph certification company, is expanding its services to include the grading of multi-signed baseballs and the grading of all autographs. Grades will be assigned on a scale of one to ten, similar to PSA's familiar, hobby-standard grading scale for trading cards. While the concept of grading autographs is not new, it is frequently used by auction houses and dealers to describe the condition of a signature offered for sale, this is the first time third-party, unbiased expertise will be available for independent certification of an autograph's grade. 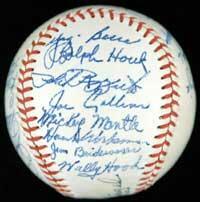 It also marks the start of PSA authenticating and grading multi-signature items, such as team-signed balls. "If the item is signed, PSA can grade it, from sports to historical to entertainment autographs," said Joe Orlando, President of PSA, a division of Collectors Universe, Inc. (NASDAQ: CLCT) of Newport Beach, California. "In addition to baseballs, whether it's an autographed photograph, jersey, bat, contract, letter, program or cancelled check, PSA now can issue a Letter of Authenticity and Grading for those items and more." The Letter of Authenticity and Grading incorporates a color photograph as well as a description and grade of the certified autograph. With the exception of baseballs, the grade is assigned to the condition of the autograph only, not the item on which the signature or signatures appear. "One of the most difficult and confusing aspects for new hobbyists is grasping how one collectible may rate versus another one in terms of quality. By creating a grading standard for the autograph market, buyers can be assured that they are paying for the quality they want because an unbiased third-party is evaluating the item, not the seller," said Orlando. An example of a multi-signed object that now can be authenticated and graded by PSA, this ball was autographed by members of the 1951 New York Yankees, including rookie Mickey Mantle. "Establishing a standard will do wonders for the market, and pricing will be more reflective of the true quality of the autographs," he predicted. The popular PSA Set RegistrySM program will continue to expand to include sets for autographs. Definitions and criteria for the PSA autograph grading standards will be available at the PSA web site, www.PSAcard.com, and published in the monthly magazine, Sports Market Report. "The card market, with the help of grading, population reports and price guides has reaped the benefits of continued growth over the past decade. Grading is a critical component of that growth; just look at the rare coin market which is far ahead of sports collectibles in terms of market maturity. That market would never have matured so successfully without the concept of third-party grading," said Orlando. "Collectors pay more for autographs that are graded. Ungraded Mickey Mantle-signed baseballs usually sell for about $400-500 at online auctions but, already, a few PSA-graded Mantle balls have brought record prices. A few examples that were authenticated and graded by PSA have brought between $2,500 and $5,000 at auction, in PSA Mint-Plus 9.5 and Gem Mint 10 condition." For additional information about PSA expanded autograph authentication and grading services, contact PSA at P.O. Box 6180, Newport Beach, California 92658. Phone: (800) 325-1121. Web: www.PSAcard.com.